Gutters are the sections of roadway that run adjacent to the curb. Their purpose is to collect and convey surface runoff to drainage inlets and in turn to underground storm sewers. The corresponding spread of water onto the pavement, or top width of flow measured perpendicular to the edge of the roadway, is a primary concern from an analysis perspective. The lateral cross slope of a traffic lane facilitates drainage of incident rainfall to the gutter. 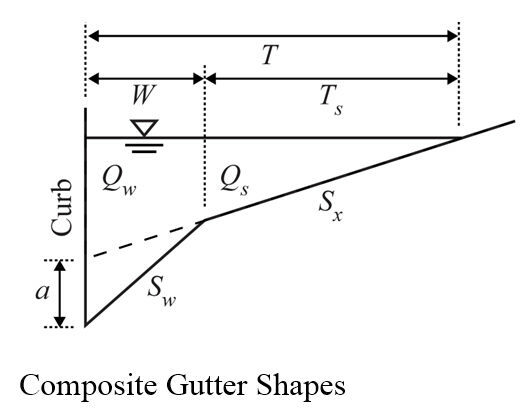 Depending on the cross slope, conventional gutters may be grouped as uniform gutter (i.e., has uniform cross slope) or composite gutters (i.e., has multiple cross slopes). 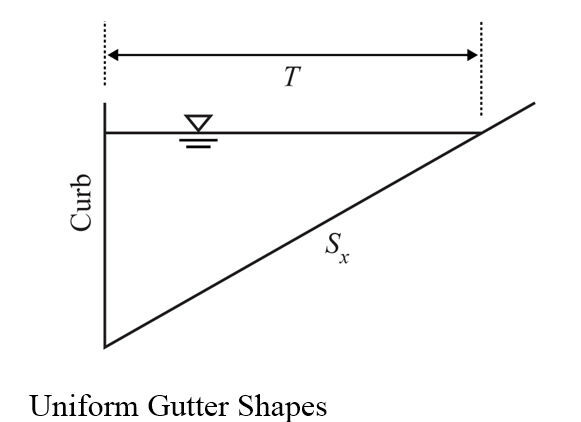 Uniform gutters have a shallow, triangular cross section, with a curb forming the near-vertical leg of the triangle as shown in the following figure. where Qw and Qs represent portion of the gutter flows for the sections shown in the figure above (m3/s, ft3/s). where a is the gutter depression (m, ft) illustrated in the figure given above.